I was panicked. It was our county fair two summers ago and I had to bring bars to a FFA Alumni fundraiser. I had a 19 month old, a two week old, a baseball playing son and thankfully my GriggsDakota mom was staying at our house. I stared with a blank look. The mere thought of being so organized to have all ingredients on hand for Seven Layer Bars seemed like a far shot in the dark. But I did have all ingredients on hand or maybe my mom went to the grocery store and quickly bought them for me. Ever since my panicked moment of baking bars for the county fair day, I have kept all ingredients to Seven Layer Bars, organized in a bag in my pantry, ready to go for the next batch of bars I have to make. Most importantly, I have never panicked over bars since my mom taught me her trick of the trade. Now I actually improvise the recipe at times, always make at least a double batch and keep extra bars in the freezer. The “guys” including my husband, son, father-in-law and our family business employees enjoy them for their coffee breaks. Our starving like a pack teenager eats them as a treat plus they are a great bar to bring camping, deliver to a neighbor or…enjoy yourself. The stack of cookbooks behind the ingredients in the above picture are vintage Farm Journal cookbooks. My mom thinks the original Seven Layer Bars came from those recipes. They are classics and are never fail recipes. I use two packages which I think is 36 squares. One box of graham crackers usually has 3 packages in it. I was doing great on making graham cracker crumbs until a little helper decided she needed to be a part of the baking process. Cooking with kids is a part of my daily life. Miss E finished off the crumbs. While we crushed, we preheated the oven to 350F and melted 1 stick (1/2 cup) of butter on the pan while it preheated. Then we mashed the graham cracker crumbs into the butter and put it back in the over for 3 minutes just to set up the crust a bit. On our first batch, we chopped pecans. I use nuts I have on hand. Pecans, walnuts and almonds all are yummy on these bars. On the graham cracker crust, we added 2 cups of chocolate chips and 2 cups of butterscotch chips, spreading evenly across the pan. Then came 1 cup of coconut. Our sixth layer was the nuts, about 1 cup across the pan. 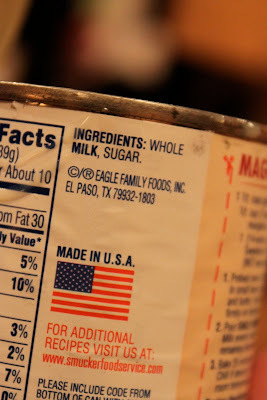 The yummy 7th layer was the sweetened condensed milk. 1 can per half of the pan works best. Drizzle it all over. If you want to replace the coconut, you can use dried fruit. I know my mom uses dried blueberries or cherries. On the second batch we added dried cranberries in addition to the coconut. We added sliced almonds on the second batch. 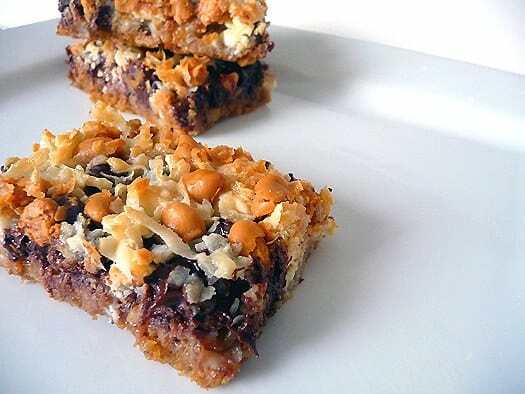 Seven layer bars are commonly called Magic Cookie Bars also. If you haven’t cooked with sweetened condense milk I usually buy the reduced fat version but I do love the regular version. Whole milk and sugar….two simple ingredients in one can creates perfect Seven Layer Bars. Bake for around 30 minutes in your 350F oven. We baked our pans for 32-35 minutes. Cool and slice. It is a must you taste one..or two warm. Then I recommend giving away, sharing, freezing and not leaving too many around to eat yourself. Working from home, alone in the house, I have been known to eat Seven Layer Bars for breakfast, lunch and snacks. They are addicting and huge hits with our family. What’s your favorite bar or cookie to make? 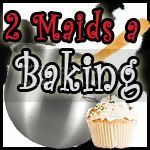 Today, I am hopping over to the Two Maids a Baking Linky Party. Liz worked at a bakery for 8 years and today she has a step by step on how to make cheesecake. She’s a friend…in real life as well fellow Real Farmwives of America. I love these bars too…they are my go to for last minute invites and PTA meetings! Katie you beat me to it! I have been thinking about doing this same blog post. I like 7 Layer Bars b/c you can use about any thing in them. Chocolate chips, White chips, PB chips, Butterscotch chips. Pillsbury crescent rolls make a good crust also. When I get mixed nuts we seem to have a lot of peanuts towards the end. Toss peanuts on the bars and cover in sweet & condensed milk and they easily disappear! I can relate. I have two girls 15 months apart. I have a son who is now 7 months old. His sisters are now 3 and 4. I am just now starting to organize things so I can have them set. These bars are so very good! I really, really love those bars. I’ve never made them myself, I think, mostly because I never think to. I usually only eat them at pitch-ins, and wonder why I never think to make them myself. And, I love the idea of using dried cranberries. THAT will be quite popular in my house! I’m not a huge fan of coconut unless it’s on my shrimp, but i could easily add more fruit. YUMMMY! Oh yummy! I make a version, usually around Christams, that uses a cookie dough crust and toffee bits with the chcolate chips. Thanks for the reminder on the great goto recipes.